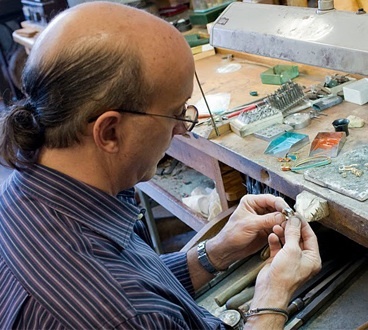 John Kennedy is a jewelry designer who has always challenged the status quo. Since starting in the trade in the 1960’s, John’s work has been shaped by his quest to redefine the approach to modern jewelry design. His ability to create simple yet sophisticated pieces that capture the essence of his passion has earned him a reputation as one of the most influential jewelry designers. 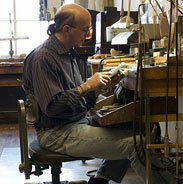 John’s emergence on the global jewelry design stage began in 1987 with the Intergold Competition. It was there where his talent for jewelry design was first recognized, earning him a place on Intergold’s prestigious world tour. His participation on the tour introduced John’s talents and innovative designs to collectors, critics, and enthusiasts who continue to celebrate his approach to modern jewelry. In 1993 John was awarded two US Patents for the innovative concepts he developed for Cylettes®. They represent two of the only five jewelry patents in application issued during the entire 20th century. The patents are the foundation and core of Cylettes®, a breakthrough innovation into the use of light through cylindrical gemstones. John discovered that the cylindrical cut allowed for the transmission of natural light unlike faceted stone cuts which only allow for reflection. With the groundbreaking design of Cylettes®, the interplay between light and stone no longer had to be purely reflective; it could be transformative. By 1996, Cylettes® had become recognized by the industry as the only unique and innovative new offering in decades. John’s subsequent acceptance into the JCK and the Tucson Design Centers as well as the MJSA pavilion for American designers in Basil, Switzerland cemented his status as one of the foremost jewelry designers in the world. Today, John continues to push the boundaries of modern jewelry design. He is highly sought after by collectors and individuals who want custom designed jewelry that is elegant and refined, yet distinct from what can be found elsewhere. Recognizing that the desire for unique jewelry creations doesn’t reside just with the collectors and galleries he has designed for, John has launched J. Kennedy Design to make his work more accessible to those who appreciate art jewelry.